Stalk and Awe Geese Management has been providing affordable and highly effective solutions for Canada goose control in the greater Columbus area for over a decade. Thoroughly trained in the biology, ecology and behavior of the Giant Canada Goose, our team of certified geese management professionals have the experience and know-how to effectively manage your nuisance Canada goose population. We have extensive experience in both commercial and residential property management fields, enabling us to understand common concerns and strive to meet the highest of standards set by our clients. Staying up to date with the newest control and deterrent methods is our number one priority so that we may offer our clients the most affordable management system. No matter what your unique circumstances are, we are confident we can design the best-suited and most cost-effective plan for your property. Geese Management is the process of understanding the behavior and needs of geese during specific seasons to help lower the impact they leave on a property. Our team of professionals have the experience and training to fully understand goose behavior. There are many aspects of geese management to consider when trying to alleviate your nuisance goose conflicts. Our integrated goose management programs take into account seasonal needs of geese and incorporates the most effective control methods. This knowledge and training enables us to successfully implement the proper goose control methods for your property. One of the biggest complaints we hear in regards to Canada geese are their droppings. A single goose can create up to 2.5 pounds of droppings per day! Not only is the feces unsightly, but they can carry parasites like Giardia, Cryptosporidium, Coliform, and Campylobacter. These parasites can be transmitted to adults, children, and pets. Another unsightly side effect of goose droppings is the possible stains and odor that occur in entry ways and carpets. That's why all of our management programs include a daily walk and entry way clearing. When done properly, goose nest removal and egg depredation, also referred to as egg addling, oiling or shaking, is recognized by PETA and HSUS as a humane and effective method to help lower populations over a period of time. Programs like Geesepeace have been formed in areas with severe population issues. Egg depredation is used in conjunction with other abatement programs, such as border collies and/or GooseJuice applications. Geese return yearly to nest where they were hatched. 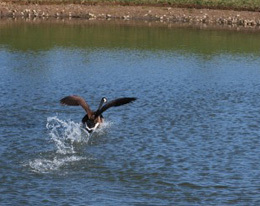 We will assist you in obtaining the necessary goose damage permits from the Ohio Division of Wildlife. 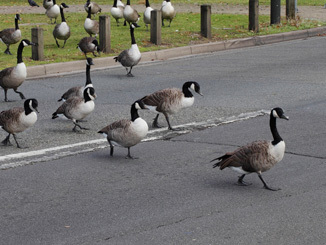 Due to the fact that Canada geese have lost their fear of humans, they tend to nest in areas located next to walk ways or entrances to buildings and businesses. Geese can become increasingly territorial when establishing a nest or incubating eggs. It is not uncommon to witness customers or employees being attacked when nests are located in high foot traffic areas. Finding a solution for an aggressive Canada goose is difficult because The Federal Migratory Bird Act protects Canada geese, nests, and young. Under this act it is illegal to alter nests, capture, or physically harm geese without a federal or state permit. 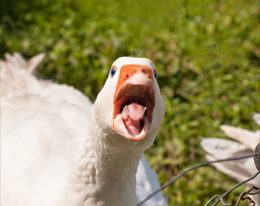 We are licensed by the Ohio Division of Wildlife and specialize in permanent goose removal solutions. The most preferred habitat for Canada geese are large, unobstructed areas of short, well-watered grass close to open water. These features that attract geese also make urban properties such as: golf courses, business parks, apartment complexes, and parks aesthetically pleasing to clients, residents, and employees. The basic principles of habitat modification include: eliminating, modifying, or reducing access to areas that readily attract geese. Habitat modification alone cannot eliminate a properties Canada goose population, especially if a flock has established residence by nesting and molting in the area. By combining abatement procedures and habitat modification, the goose population is more likely to decrease. Various manufactures and distributors of goose control products. Our humane goose control methods are supported by the Ohio Department of Natural Resources, the Humane Society of the United States, and PETA. We can provide a variety of literature and documentation from organizations like PETA and The Humane Society of the United States. These documents explain the need for humane goose control and that our methods are within the standards set by their organizations. Our commitment to educating the public about geese management helps ensure that safe and humane methods are practiced effectively for maximum success. Call or send us a message online today to schedule a free site inspection or to request more information. The contents of this webpage are Copyright © 2019 Stalk and Awe Geese Management. All Rights Reserved.